ER loves to leverage relationships with our partners to maximize impact. The following story is a great example. ER operates the Golden Hands Livelihood Educational Program which teaches vulnerable women sewing and business skills so they can help provide for their families. IT Tender serves struggling communities through education, skills training, nutrition and more. By working together, IT Tender was able to place three women into the current Golden Hands training course. For many poor Filipino families, the mother is the fiber that holds the fabric of the family together. A long list of problems threatens to unravel the family – unemployment, poor health, substance abuse, domestic abuse, and more. Nevertheless, through her wisdom and resourcefulness, a mother does her best to provide and make a better future for her children. At IT Tender, our expertise is empowerment through education. Education doesn’t begin or end in the classroom, and it doesn’t end at a certain age. Mothers in our communities are hungry to learn more practical skills, some of which our staff aren’t always equipped to teach. This is why we partner with other organizations in a variety of fields, including skills and livelihood training. One of our partners, Extreme Response, runs a program called Golden Hands for urban poor mothers in Manila. This program mentors struggling mothers while training them to use sewing as an income-generating sideline for their families. They meet once a week, encouraging one another and practicing basic sewing and pattern making for skirts, bags, aprons and much more. Program director Anne Benavidez created Golden Hands with a holistic vision. Her passion is to empower women not only by developing skills, but also by developing self-confidence and trusted relationships. Three mothers with children in IT Tender’s programs are currently attending Golden Hands, and we’re proud of the growth they’ve experienced through the program. Scroll below to learn more about IT Tender. One of those communities, Napacor, was reduced to rubble from a fire. (Pictured at right are before and after images.) Each of the 50 homes was destroyed in less than an hour. Thankfully, each family escaped with no injuries. However, most lost everything they owned – shelter, food and clothing. IT Tender was able to provide each of these families with extensive relief kits, which included food, cooking utensils, clothing, sleeping mats, blankets, pillows, sandals and more. Another community, Upper Sucat, was demolished so the land could be developed into a commercial property. Some 100 families were left without a home. Many were able to save their belongings and move out safely before the demolition, but some lost belongings and others lost family businesses, such as sari-sari (variety) stores and farm land. IT Tender was able to assist these families in finding or building new homes, and with the help of a $2,500 donation from ER, also funded livelihood projects that would help the families move forward with a sustainable income. IT Tender’s social worker and community development staff engaged the families through group orientations and individual meetings. Beneficiaries presented their plans for a business or livelihood project. Many were re-starting a business or livelihood they had lost due to the fire or demolition, such as a variety store or canteen/restaurant. Others presented plans based on their skills and background. IT Tender continues to follow up with the beneficiaries to track their wellbeing and success. Following are images and testimonials from some of the beneficiaries of ER and IT Tender aid. There’s good news among the devastation that hit the NAPACOR Tower community in April. After losing their homes to a massive fire and being told they cannot rebuild in that location, many of the families are getting resettled. With a lot of help from ER partner IT Tender (ITT), families have been able to move to new housing and in some cases, new businesses. ITT went far beyond its mission by helping relocate and transition many of the families. Rita, her husband and her two sons were one such family. After the fire, they found a simple home to rent near the elementary school the boys attended. However, they were anxious about whether they could afford rent and daily expenses on their small income. Rita’s husband works in construction and she has always stayed home to cook, clean and hand wash their laundry. Rita came up with the idea to build a simple convenience store at the front of their new home. IT Tender helped supply the materials for the store, a freezer for cold drinks, and other initial products to sell. Rita is now successfully managing the store and supporting the family through this business. I remembered that my mother was urging me to wake up, which was unusual. She shouted at me to run because there’s a fire. So I immediately ran down the stairs and even forgot to put on sandals. I tried to go back to our house to retrieve some things but there was too much smoke, and we also heard an explosion caused by the gas tank of our neighbor. Rita is thankful for IT Tender’s assistance. My mother asked me to watch over my younger brother because she was trying to get a few clothes. I was starting to see with both my eyes how the fire consumed our house. That’s when I realized how hard it is to lose a home. We were still crying after the fire died down. What added to our pain was that the owner of the electric tower was yelling at us and telling us that we can never go back. My family and I chose to stand up again after that trial. I am so glad that we are part of IT Tender. They are the first ones who rescued us and offered us a temporary shelter. A lot of people were helping us, and through IT Tender we were able to receive clothes, hygiene, food and more. No matter what we felt, we knew they are always there to support us. I even cried when I learned that we will have our own store again, and this time it is better than our store in Napacor. From the bottom of my heart, I’m very thankful to IT Tender, to the local government, and to the rest of the people who helped us. I learned to never give up, even when you lose everything. “The fire is a severe trial that I never imagined would happen to my family. It was an ordinary morning for us and we were having our breakfast when we heard our dog barking wildly, and it was very noisy outside. I asked my son to check what was the commotion about. When he came back he was shouting ‘Fire!’ I urgently told my children to go outside while I carried my then 3-month old baby. I was panicking because there was no one to help me. My husband was working. I tried to go back to our house and save important documents. My children were crying. I told them not to be sorry for all the things that we lost but instead be grateful because we are all safe. And having a complete family is priceless. After the fire died down, I couldn’t help but felt depressed when I realized we had lost our home for 15 years. My children are part of IT Tender which is a very great help for us. Through the organization, I was able to start a small business and also receive assistance in fixing our new house. I praise God because of His goodness, for saving my whole family, and for helping us to start over again. 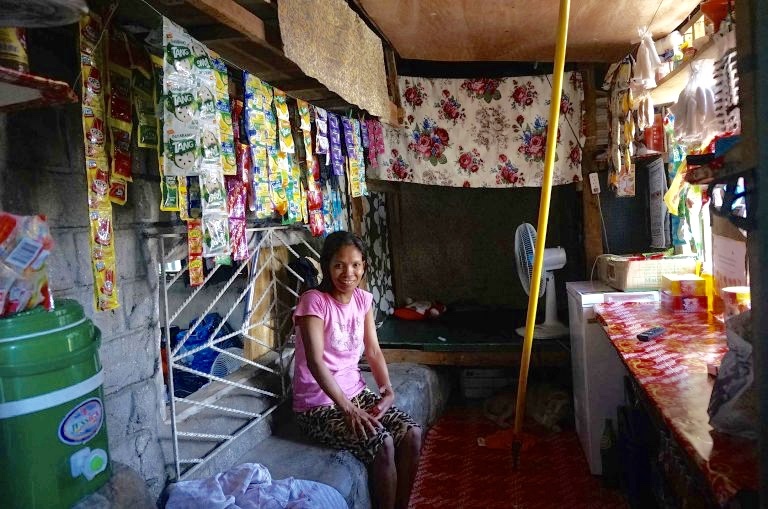 Read more of Jizza’s incredible stories direct from the NAPACOR fire victims here. 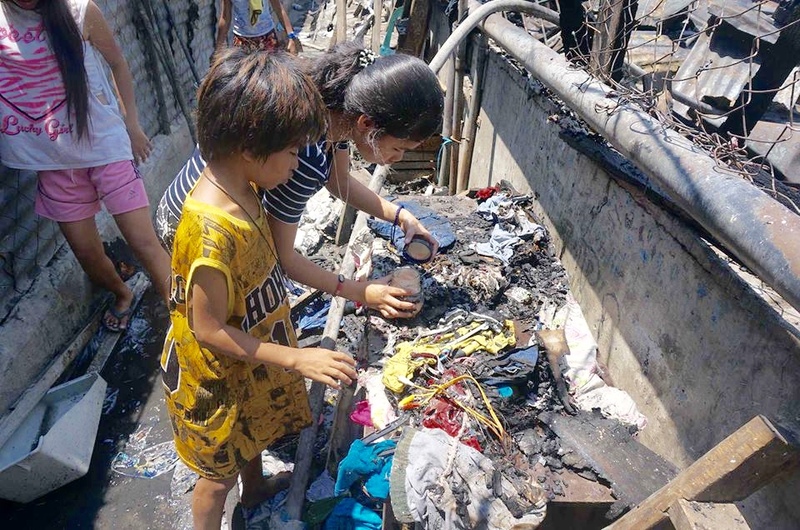 Unfortunately, the Philippines government has no relocation plans for the families who lost everything to the devastating fire at NAPACOR Village on April 18. The families are not allowed into the area where they lost their homes. The government will provide some money for the families to rent a room that is good for up to three months. They also are providing some relief goods. At IT Tender, we are offering different goods in our relief kits in order to avoid duplicating the same help. IT Tender is planning to organize the parents with the hope of creating a livelihood project. We truly appreciate all the help in rallying for this urgent and important cause. We’re blessed to work alongside ER in changing lives and helping those living in extreme situations. If you would like to donate to IT Tender, click here and select “IT Tender Ministries” as the designation in the drop-down menu. If you would like to give through Extreme Response in the U.S., click here. If you would like to give through ER Canada, click here and choose the designation “Disaster Relief” from the dropdown menu. Scroll below to see a video and photos of the fire and the destruction it left behind. A huge, tragic fire swept through the squatter community of NAPACOR Village yesterday leaving hundreds homeless. Miraculously, there was no loss of life. The NAPACOR community is very familiar to Extreme Response because our partner IT Tender is located next door and has taken many visitors to meet the residents. IT Tender serves the community by providing educational support and much more. NAPACOR Village before the massive fire. Here’s what IT Tender’s John Coffey has shared so far: Urgent help and prayers are needed for NAPACOR – one of three urban poor communities we serve. Today the entire community was reduced to rubble by a fire that engulfed all of the homes in less than an hour. Thankfully each family is safe and no one was seriously injured. However, most of these families lost everything and are literally without shelter, food and clothing. Since the need is immediate, we are already purchasing items for “relief kits” that we will give to each family. A relief kit costs $100 and provides the following for a family: food (rice, canned goods, noodles), cooking utensils and dishes, sleeping mat, blankets, pillows, sandals, hygiene supplies (soap, shampoo, toothpaste, toothbrush, detergent, dish washing liquid), simple clothes and bags. To learn more about NAPACOR and IT Tender, scroll below. ER’s Joshua Benavidez shares this update. “Last Thursday we were able to bring food, water and clothes to (ER partner) IT Tender. The fire victims can’t go back and rebuild their homes. The burn site has been barricaded and no one is allowed to enter. We are waiting for the government to decide whether the community will be relocated or be sent back to the province. For now, five families are staying at the IT Tender Drop-In Center while the rest stay at a school. IT Tender is providing relief kits to each family during this time of crisis. William, an 11-year old boy living in a squatter community in the Manila suburb of Putatan, initially came to IT Tender through a nutrition program called Food For Life. One day, William stopped attending Food For Life and instead began spending time with a gang of older youth. Karin Jose, the nutrition program’s coordinator, repeatedly visited and followed up with William, doing her best to encourage him to return to the program, but he seemed more interested in hanging out in the streets. The nutrition program ended after a year, but IT Tender staff wanted to maintain the relationships with children who had been a part of it. They decided to establish an evening drop-in program called Nightlife in which kids could continue enjoying healthy meals and also be tutored in their studies. Jam Coffey, who began at IT Tender as a volunteer teacher in Food For Life, become the head teacher of Nightlife in the Putatan and Alabang communities. Jam attended an extensive training course at the Institute for Foundational Learning to help develop her teaching skills. Incorporating what she learned at the Institute, she introduced a curriculum at Nightlife called SSRW (Sing, Spell, Read and Write), and she also began sharing stories with moral lessons. Upon conducting an enrollment and diagnostic test for the Nightlife children, Jam was surprised to see William among the enrollees. In her conversations with him, she found him shy and clearly ashamed about his past behavior, but she welcomed him with open arms and quickly made him feel comfortable being part of IT Tender’s programs again. Now William is one of the early birds at each Nightlife session, holds a perfect attendance record, is active in lessons and achieves high scores in the exams. Most importantly, he is proving to be a good listener, and is kind to others. The IT Tender staff also recently discovered he has a talent in singing and dancing; the excitement he brings from that is contagious to the other children. It has been a joy to witness William’s new journey. In just a short time back at IT Tender, he is transforming from a caterpillar to a beautiful butterfly! ER partner IT Tender seeks to empower children to become educated and responsible leaders in their community. Within a few years, these kids will be forced to consider life on the streets, where every bad thing awaits them. We arrive in Manila immediately after a hurricane, but Filipinos respond with a collective shrug. Utility crews wield chain saws, Pedi cab drivers drop their plastic covers, bikers throw on ponchos, and kids run barefoot without noticing they are soaked. Life goes on with barely a blip. Today our four-man Extreme Response team has an appointment to visit IT Tender, one of our partner organizations here in the Asia Region. IT Tender is part of International Teams Philippines and is comprised of seven staff members. They embrace the Herculean task of caring for the street kids and those living in poverty in Mutinlupa City, near Manila. From an outsider’s point of view, it seems like a hopeless endeavor. There are simply too many dirty, uneducated, glue-sniffing beggars to help. The poverty is too vast. The task is too large. Why bother to rescue a few, when there are so many? The IT Tender staff doesn’t see it that way at all. Several of the staff have lived in poverty. Some still do. They have lived the lives of desperate kids and know how to alter their outcomes. They understand how to help change their lives. One staff member even lived in the squatter community located directly behind the IT Tender offices. John Coffey visits one of the 60 families at NAPACOR Village. We meet IT Tender Director John Coffey, who prefers to be called Team Leader. He’s a guy who is equally comfortable running a slide presentation or visiting a squatter family in their home. John has worked with street kids for five years and is engaged to another IT Tender staff member. Originally from the Toronto area, John has a degree in elementary education. Mutinlupa City is now his home. He tells our ER team about numerous IT Tender outreach programs the small crew runs. How do they do it? Many are juggling two jobs for IT Tender. Their primary focus is on early child education. The premise is that if preschool kids can receive basic education and encouraged to see school as their future, there is hope for a better life. While those tiny tots are learning the basics, their moms are taught the enormous value of education, as well as hygiene and nutrition. Even today, children here die from treatable diseases, including something as basic as diarrhea. The Tender team does much more. They also run a drop-in center for people to take showers, eat meals, receive counseling, and take some classes. At night, the staff goes into poor communities looking for street kids to invite to Nightlife – a program that provides safe alternatives. Many kids sleep on the streets and abuse drugs, glue or alcohol. Sadly, without IT Tender’s intervention, they face an ugly future. Some of their best work is with people living in extreme poverty. IT Tender staff members visit squatter communities and befriend the families. Their heartfelt, judgment-free compassion engenders trust among the squatters – who typically trust no one. Why would they? Most people look down on them. We depart the Tender offices for a walk around back and are greeted by an enormous electric power tower. Below the wires sits a conglomeration of scavenged wood, metal, tires and plastic all perched on the tower’s cement base. Squatters have ingeniously tied into the tower’s strong metal architecture to create a somewhat stable housing complex. In the U.S., living near an electric power tower has a stigma. It’s terrible for real estate value. Some consider the towers a health risk, maybe something that could fry their brains. The people living below the tower don’t have the luxury of worrying about stigmas. They are squatting there because they need basic shelter. This is how they survive. Welcome to NAPACOR Village, where 60 families shoehorn into the hand-built maze of cubicle-sized homes. While the building appears somewhat stable, it also looks like one good monsoon or inadvertent fire could destroy it in an instant. We step around chickens, feces, and cloudy puddles to draw nearer. An open sewage drain is a few feet away. Kids are everywhere and greet us with big smiles. They may live in squalor, but their faces show hope. Most are too young to realize the hard road they soon will face. We see wet clothing hanging throughout the complex. There are no washers and dryers here. Clothes are washed by hand and then air-dried. Because of the steady rains, clothing is stuck in the wash cycle for days. As we approach the complex, a smoky aroma fills the air. Most cooking is done outdoors with wood or charcoal, but some people risk cooking with fire indoors. We are invited inside a home to meet a mom, Anna Lisa, and see how her family lives. The people of NAPACOR know John and the Tender team and welcome us. One of Anna Lisa’s children is part of IT Tender’s Sponsor-A-Child program to attend elementary school. $20/month provides a uniform, materials, lunch and transportation. It’s a huge benefit that only 20 kids receive. IT Tender has a waiting list of 50 more kids. We climb a ladder and ease into her home. I’m immediately struck by the cramped quarters, the thick humidity and I begin sweating. Moisture hangs in the air. This home has no electricity or plumbing. It looks to be about 8 feet wide by 10 feet deep. All their possessions are within view because this is their entire living space. I am shocked when Anna Lisa says her seven children and her husband, who drives a truck for a funeral home, all sleep side-by-side in a tiny loft above the room. That’s nine bodies stuffed like sardines into a sweltering box. I’m both amazed and horrified at what this family has to do to survive. Anna Lisa tells us that she’s lived at NAPACOR Village for 20 years….20 years! During the course of the next hour, we visit two more families. One family has somehow managed to get electricity and enjoys a few conveniences. A daughter is also getting a scholarship from IT Tender. This is a big deal that will change her future. While public school is free in the Philippines, families must pay for uniforms, supplies and lunch. Many poor kids drop out of school because their parents cannot afford even these things. The cycle of poverty is brutal. As we move through the narrow corridors, my heart aches for the kids running free throughout the complex. They are cheerful and excited by our visit. They ask me to take their pictures and smile when I show them the digital images. Yet I know that within a few years, these kids will be forced to consider life on the streets, where every bad thing awaits them. We conclude our tour by following two kids up three ladders to another one-room box. This “penthouse” contains the family’s few possessions. The children hug and mug for the camera, and I tear up as we head down. As we depart we learn that NAPACOR Village, home to a couple hundred people, may get torn down. A developer is said to want them out. Like most squatters, people here live with the constant fear their homes will be destroyed and they’ll be homeless. “Many adults in the community thank us each time we visit,” Coffey said. “They do this because our free preschool has helped their children learn how to read and write, or because of our Sponsor-A-Child program allows their children to attend school instead of begging in the streets, or because of our Night Life program provides their children with a safe place to take a shower, eat a healthy meal, and learn responsibility and good character. Extreme Response exists to give hope to the hopeless. That’s why we work with partners like IT Tender, an organization battling in the trenches for families who face severe, sometimes life-threatening hardship. There are a couple ways you can help. Consider volunteering, making a donation, or becoming an intern in one of our regions. Or, you also can help IT Tender meet needs directly. Among other things, they need monthly sponsors so kids can go to school. Click here to learn more about IT Tender.